Not to be confused with South Bay, San Diego or South Bay (San Francisco Bay Area). The South Bay is a region of the Los Angeles metropolitan area, located in the southwest corner of Los Angeles County. The name stems from its geographic location stretching along the southern shore of Santa Monica Bay. 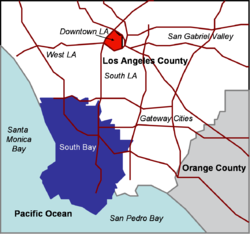 The South Bay contains fifteen cities plus portions of the City of Los Angeles and unincorporated portions of the county. The area is bounded by the Pacific Ocean on the south and west and generally by the City of Los Angeles on the north and east. And other small unincorporated "county strip" areas of Los Angeles County. 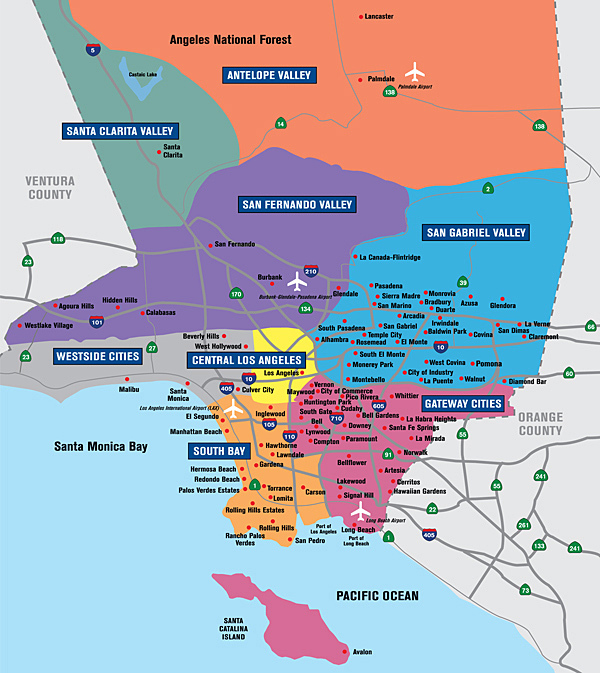 The region is bordered on the north by LAX, on the northeast by the South Los Angeles region, on the east by the Gateway Cities, and on the southeast by Long Beach. The Harbor (I-110), San Diego (I-405), Gardena (SR 91), and Century (I-105) Freeways provide the region with its principal transportation links. The Los Angeles MTA's Blue Line (opened in 1990) is a light rail line running between Downtown Los Angeles and Downtown Long Beach. It is the first of the MTA's modern rail lines since the 1961 demise of the Pacific Electric Railway's Red Car system. The Green Line (opened in 1995, together with the Glenn Anderson Freeway), a freeway-median light rail line, also serves the South Bay. It runs between Redondo Beach and Norwalk in the median of the Century Freeway (Interstate 105), providing indirect access to Los Angeles International Airport via a shuttle bus and future automated people mover. 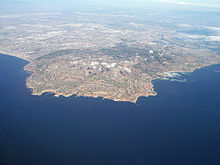 Several ports and harbors in the South Bay provide access to Santa Catalina Island, a popular resort. In addition, Los Angeles International Airport borders El Segundo to the north in the neighborhood of Westchester, Los Angeles. The South Bay is one of the most culturally, economically, and ethnically diverse areas in the United States, with a largely even distribution of the population across African, Asian/Pacific Islander, European, Arabic, and Latino ancestry. However, the racial and economic makeup varies widely across the region. El Segundo, Hermosa Beach, Redondo Beach and Torrance have a mixture of middle-to-upper class residents, of which are mostly White American and Asian American. The Palos Verdes Peninsula and Manhattan Beach are two of the wealthiest communities in the United States, with some of the most expensive real estate in the United States. The city of Carson has large populations of Filipino Americans and African Americans. Hawthorne, Inglewood, Gardena and Lawndale are diverse communities with pluralities of blacks, Latinos and White Americans. Gardena is home to one of America's oldest Japanese communities. In addition, San Pedro has a large community of Italian and Croatian immigrants. The Port of Los Angeles, sprawling across the shorelines of San Pedro and Wilmington, is the busiest in the United States. When combined with the Port of Long Beach, it is the fifth-busiest in the world. Traditionally, most of the populations of Wilmington and San Pedro have worked for the port in some capacity. It is increasingly the primary driver of the Southern California economy: industrial growth in the Inland Empire is almost entirely attributable to increased port traffic since the 1980s. Unfortunately, the massive increase in cargo volume has created significant air pollution (especially of particulate matter resulting from the combustion of low-grade marine diesel fuel) in neighboring communities. The South Bay is the traditional home of Southern California's aerospace industry. While considerably shrunken from its Cold War peak, it still represents a major economic force, employing thousands in high-skill, high-wage engineering positions and generating enormous amounts of tax revenue. Northrop Grumman has a major facility in El Segundo where the F/A-18 Hornet fuselage is manufactured, as well as the headquarters of the Space Technology division in Redondo Beach and a facility at the Hawthorne Municipal Airport. Alcoa Fastening Systems, a subsidiary of Alcoa Inc. which produces aerospace fasteners, has their corporate headquarters located in Torrance with manufacturing facilities in both Torrance and Carson. Boeing and Lockheed Martin also maintain extensive production facilities throughout the South Bay, and Raytheon's Space and Airborne Systems business unit is based in El Segundo. The Los Angeles Air Force Base, in El Segundo, is the locus of much of this aerospace research activity, as it is the primary development facility for military satellites and other space programs. DirecTV, a former subsidiary of Hughes Aircraft, is also headquartered in El Segundo for this reason. SpaceX also headquartered in the South Bay, is located in Hawthorne. Petroleum refining is another important component of the South Bay's economy. Major South Bay refiners include Tesoro (ARCO facility in Carson), Chevron (El Segundo), Phillips 66 (Wilmington), PBF Energy (Torrance), Tesoro (Wilmington), and Valero (Wilmington). These refiners supply the lion's share of petroleum products for Southern California, as well as for Nevada and Arizona. As the Los Angeles region's oil fields are mostly exhausted, most of the crude oil that feeds the refineries is brought in from terminals at the port. Local politicians and activists have long denounced the refineries for the amount of air pollution they generate, but in recent years these protests have been muted as the Port of Los Angeles has become the region's dominant polluter. The controversial practice of residue flaring returned to the forefront during the September 12, 2005 Los Angeles Department of Water and Power outage; facing dangerous pressure buildups, refinery operators in Wilmington were forced to flare, resulting in dangerously bad air quality throughout the southeastern South Bay. The incident has renewed calls for restrictions on flaring in non-emergency situations. In addition to the Los Angeles Times, the South Bay cities are served by their own daily paper, the Daily Breeze, the weeklies The Beach Reporter and The Easy Reader, a bi-monthly real estate magazine South Bay DIGS and a bi-monthly community paper South Bay Community News. Black Flag guitarist Greg Ginn's SST record label, a seminal alternative rock label of the 1980s, maintained its headquarters in Lawndale. ^ "The Most Expensive Zip Codes". Forbes. Archived from the original on January 24, 2007. Retrieved 3 October 2006. Wikivoyage has a travel guide for South Bay. Wikimedia Commons has media related to South Bay.